Hey Guys! 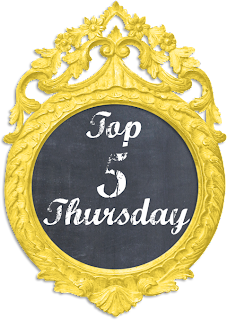 Welcome to another Top 5 Thursday! This week I wanted to share some of my favorite Valentine's Day food ideas! Most of these are perfect for kids! The first one is this super cute heart shaped sandwich. I love sandwiches and these one is easy to do, but definitely gets the Valentine's theme across. Casey Rollins's pin on Pinterest. This one is a perfect snack option! It is really easy! Just slice your apple, and then use a heart shaped cookie cutter to cut out the core. Next fill it with peanut butter, oatmeal, raisins, etc. Yummy! This next one is another snack idea or it would be a great "dessert" idea for small kids. It is simply a couple of cereals and some yogurt bites. It looks so good! The pink makes it very Valentine's Day. This one is a yummy little heart shaped calzone! You can fill this with all kinds of things for a yummy Valentine's Day dinner! And the last one is a delicious heart shaped breakfast! Eggs in a hole is one of my favorite breakfast meals anyways, but using a heart shaped cookie cutter to make the hole is a great idea for Valentine's Day. If you are worried about the egg just being cracked into it whole like that, you can do what I usually do for Matthew and scramble the egg and place it inside the hole. And there you have it! Lots of really simply Valentine's Day food ideas! What kind of treats do you like to make for your loves on Valentine's Day? If you try any of these, please let me know!